Home of "The Big Bend Railroad Club"
"The Big Bend Railroad Club"
We are a 2-Rail O Scale (1/4" to the foot) model railroad club that started in 1938 and have been located in the same building at 8833 Big Bend Boulevard, just west of Elm, in Webster Groves, Missouri for the whole time. 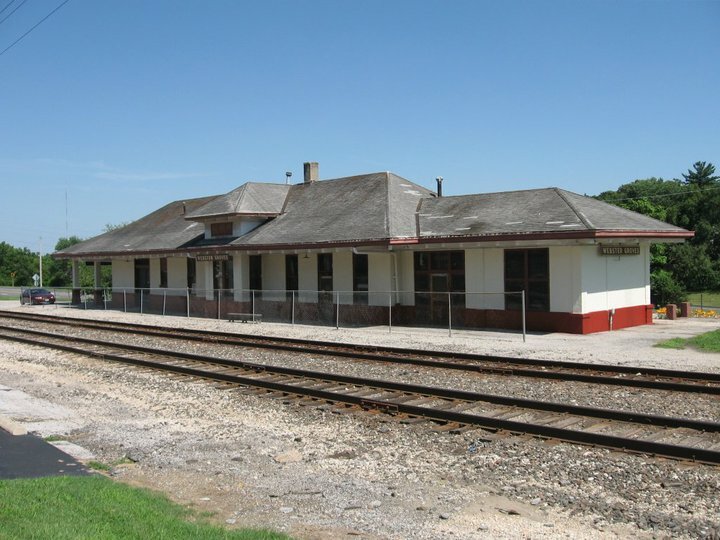 The building is a former passenger depot for the Frisco Railway that was constructed in 1910. We purchased the building in 1994, to save it from demolition. And with help from donations and manpower, we are now in the process of making some needed major repairs. We operate for the public on the first Tuesday of the month (Except holidays) from 7:00 PM until around 8:30 PM, with extra nights in December, and other days for special occasions. We meet each Tuesday at the station. The public is welcome to drop by on any Tuesday evening, and have a look around, but be aware that there may not be any activity on the layout other than the ongoing repair work. A letter from the President . . . Unique in the world of model railroading is a large O scale 2 rail layout, and unique in the metropolitan St. Louis area is a model railroad club that owns a real railroad depot as a home for their display. As owners of the former Frisco Railway Depot containing a sixty-foot long O scale layout in Webster Groves, Missouri, the Big Bend Railroad Club is just such a unique entity. Explore these website pages and see the life-like aspect of the true O scale 2 rail model railroad that is at the center of this one-of-a-kind model railroad club. Then come witness the realism of O Scale operations on the First Tuesday evening of any month, when club members place their true quarter inch scale locomotives, passenger cars and freight cars on the rails of the scenic Springfield & Ozark Railway, where they have been running for visitors and club members’ enjoyment since 1938. On other Tuesday evenings you may find our members busy building new scenery, modifying the layout or performing maintenance on our classic one hundred year old station building. Come on out and experience the excitement, whether you are a spectator or eager to join our club and get involved. Welcome to the Big Bend Railroad Club, where the magic of model railroading becomes real.